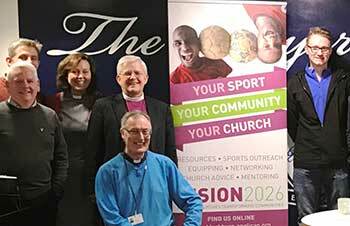 The ‘Ministry of Sport’ was created in 2015 by Bishop Tony Porter (who is the Archbishops’ Adviser on Sport) and it has been rolling out across Church of England Dioceses ever since – with Blackburn Diocese being the latest to get involved. Bishop of Blackburn, Rt Rev Julian Henderson, is fully supportive of the initiative and attended the launch, which took place in the Players’ Lounge at Deepdale, along with people from across the County who were interested in getting involved. The main aim of Ministry of Sport is simple … to encourage Christians participating in sport and sports chaplaincy to use it as part of outreach work of the local church. Several of the driving forces behind the launch of the Ministry of Sport initiative in Lancashire were at the event including Rev Canon David Banbury, Leader of the Diocesan Parish Mission Support Department; Keith McIntosh, who is an active member of St Andrew’s Church in Leyland and a longstanding voluntary supporter/member of the ‘Christians in Sport’ organisation and Rev Chris Nelson, Vicar of Penwortham St Mary’s Church and Chaplain for Preston North End. David is a keen runner and has enjoyed playing football and American football in the past. He said: “Ministry of Sport is about being a positive Christian presence in our communities, enjoying and promoting sport as a way of engaging people with the Gospel message. Keith added: “The positive aspects of sport can benefit everyone – specifically those aspects aligned to integrity, honesty and fairness, which are the basis of the Christian gospel.